Description: Union Station is Denver, Colorado’s historic train station. The station first opened in 1881. Amtrak operates out of this station and it’s one of the city’s landmarks. 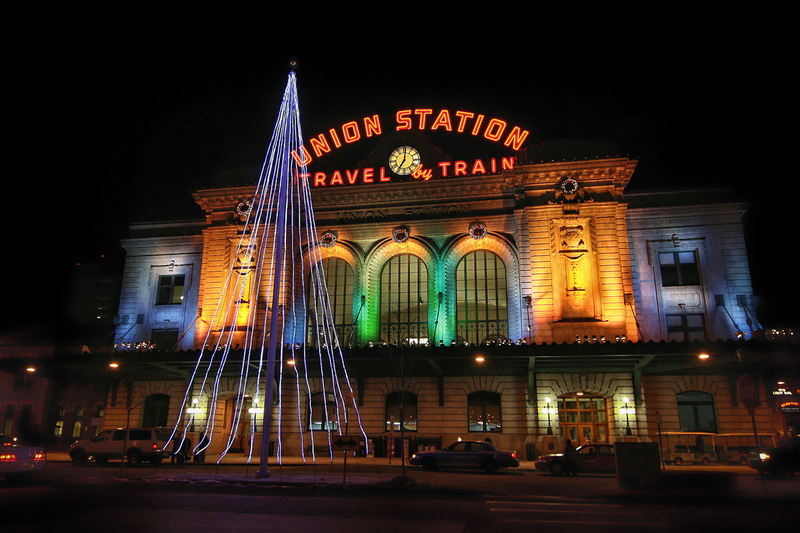 Union Station is lit up for Christmas each year as part of Denver’s “Grand Illumination.” The lighting ceremony usually occurs the last weekend in November and the buildings remain lit until mid-January. Photographing This Landmark: The best place to take a photo of Union Station is at the intersection of 17th and Wynkoop Street. You’ll definitely need a tripod for this night time shot. You have two options to capture the light – one is a high ISO speed and the other is a long exposure. In this instance, we chose the higher ISO speed because there’s a lot of traffic in the area and we wanted to capture the photo without a lot of cars in the foreground. Our settings for this photo: 16mm lens, ISO 1600, 1/60, f4. We used a noise reduction filter in editing.